I am in the Twin Cities on a weekly basis and tend to find myself in the St. Louis Park area around lunchtime. Wok in the Park has been on my resto list for quite some time because it’s ranked #2 on Trip Advisor. I’ve put it off because I know Dusty would probably enjoy eating there as well. An opportunity presented itself when Dusty and I were both in the area and were getting hungry- I knew exactly where we’d be dining. Super cute and unexpected atmosphere. Service was friendly and attentive. We knew exactly what we’d be ordering even though we hadn’t been there because we checked out the menu online. 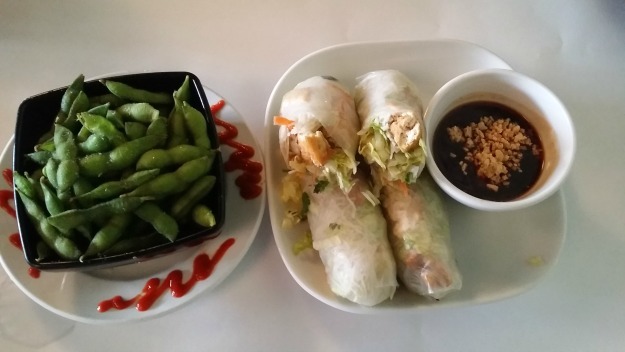 We ordered the Summer Rolls, vegetarian style and added tofu, as well as a side of edamame. They were both so good, as was the dipping sauce, which we pretty much wanted to drink right out of the cup. 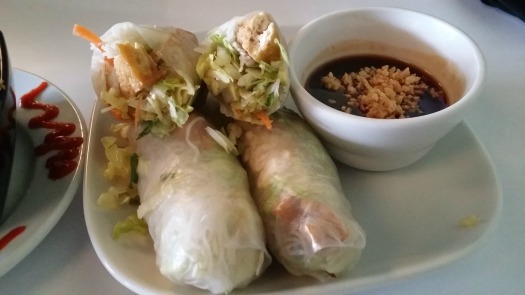 The spring rolls were full of flavor. We love to order them and these were some of the best. it had all the fixin’s with lettuce, sprouts, carrots, cilantro and basil. An enormous bowl of Pad Thai! Love it when they pack the peanuts on top. Dusty ate his right away and I left with a huge portion of leftovers. It was! The bar is high now for Pad Thai after eating it there. I just recently went here for the first time and thought everything was so great! We ordered the Pad Thai, too! We dream about that Pad Thai! Wok in the Park is so great! I love that they make it easy for me to order as a vegan. And the cherry blossom murals add so much to the ambiance. Now I’m hungry for pad thai! Totally agree on it being easy to order Vegan. 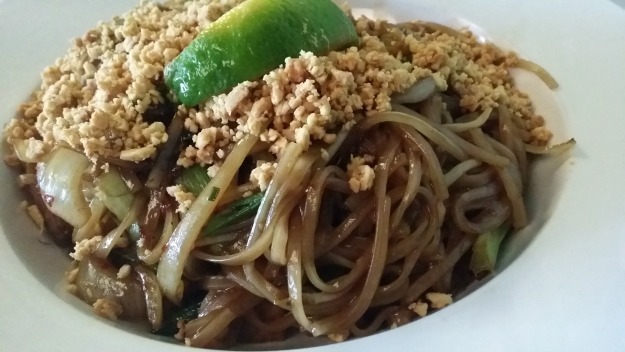 We’re hungry too for Pad Thai today- we shall remedy that!